Quesadillas are traditionally Mexican/TexMex dishes of folded tortillas, simply stuffed with cheese. Other fillings can be added, and this recipe uses a hot chicken sauce. I use a single hot chilli, Fatalii. This is like a habenero or scotch bonnet pepper from the perspective of heat, and as such I don’t chop it up – I cook it whole amd remove it at the end. It adds a wonderful intensity of flavour as well as chilli heat. You can replace this with any chilli you wish – if you are using something milder, e.g., a Cayenne type, you may want to chop the pepper and add it seeds and all. 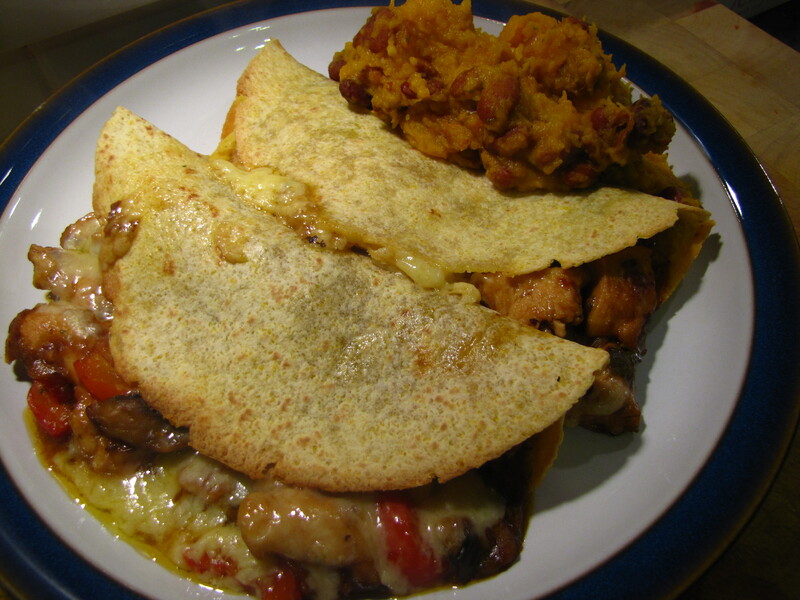 In an oven-proof tray, carefully spoon the chicken mixture into corn tortillas, top with grated cheese and fold in half. REMOVE THE CHILLI! Serve immediately with a little salad, a portion of Mexican Smashed Squash & Beans, and a hearty bottle of red wine!